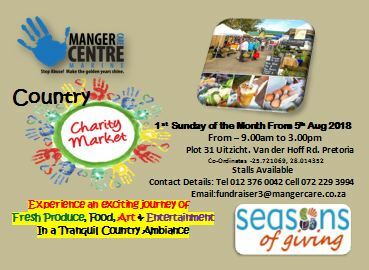 An exciting journey of Fresh Produce, Food, Art, Craft and Entertainment awaits visitors when Manger Care Centre launches the Charity Country Charity Market on 5 August 2018 and then every 1st Sunday of the month from 9am to 3pm. Family & Pet friendly. (No lions or tigers but elephants with their own fruit will be considered). With a peaceful country ambiance, beautiful shady trees, abundance of bird life and panoramic views of the Magaliesberg makes this a tranquil and safe environment for the whole family away from the hustle and the bustle of the city life where the kids can go wild with all the kids activities. Enjoy a delicious breakfast or lunch @ The Food Court with Live Entertainment. Choose from the variety of food stalls, variety of beverages from a glass of wine to a special brewed cuppachino with delicious cake! In addition to other exhibitors the market will underscore MCC Benoni Work Creation Projects & Future Sustainability. MCC Benoni will be exhibiting exciting products from their Carpentry Project, excellent craftmanship in their Upholstery Department, freshly homebaked bread from their renowned Bakery and other Homebaked Items. Other delicious food, Boerewors Rolls, Pancake etc will be done by the residents of MCC Marine Pretoria. The market will take place on the premises of MCC Marine which will allow the public the opportunity to visit our centre and experience first hand the projects, interact with the residents and what the needs are to cultivater a caring and loving environment that enables positive upliftment and empowerment for the people. Although the accommodation is humble, we like to keep it in good repair, clean and hygienic. Giving the residents a safe place, hot shower, comfortable bed and a good plate of food. There will be no stall fee, but only a “blessing” towards the centre! We will be marketing this exciting market extensively to ensure the public are aware and draw the necessary feet and buying power, making it a long and successful monthly event.